Sometimes parents do bad things. They don't mean to; they just do. When I was young, I didn't particularly like sports, and I spent most of my time reading, and living in fantasy worlds. My parents used to worry that I didn't get out enough, and that I spent too much time on my own. They didn't need to worry; they were doing a pretty stand-up job raising me. And I was happy. But I remember one day, when I was about fourteen years old, I was building something out of LEGO. My mum said, "Aren't you too old to be playing with LEGO?" It made me feel childish and stupid. I don't want you to think badly of my mum. I know that what she said, everything she ever did, came from a place of love. She was merely concerned because she saw me doing something that she did not consider to be "normal," and she has never been very good at keeping her opinions to herself. I think she would be mortified if she knew how much it upset me at the time. Nevertheless, I lied to my mum that day. I told her I was checking all the pieces of the LEGO were there so I could sell it. And then I sold it. Fast forward over 20 years, and here I am. The boy who created fantasy worlds in his head now puts those fantasy worlds on paper, has a family of his own, and yes... he plays with LEGO. I am fortunate. I have a daughter who absolutely loves LEGO, and we spend hours at a time playing with her collection of Marvel characters, or building houses for her Simpsons minifigures to live in. It is one of my favourite things in the world, and I love to see what creative things she makes, and the stories she invents as she plays. Of course, as much as I love LEGO, my real passion is for board games; so when LEGO started making board games, it seemed like it was a match made in heaven. Sadly, most of the LEGO games were mediocre at best, and there are very few of them that are really worth owning. 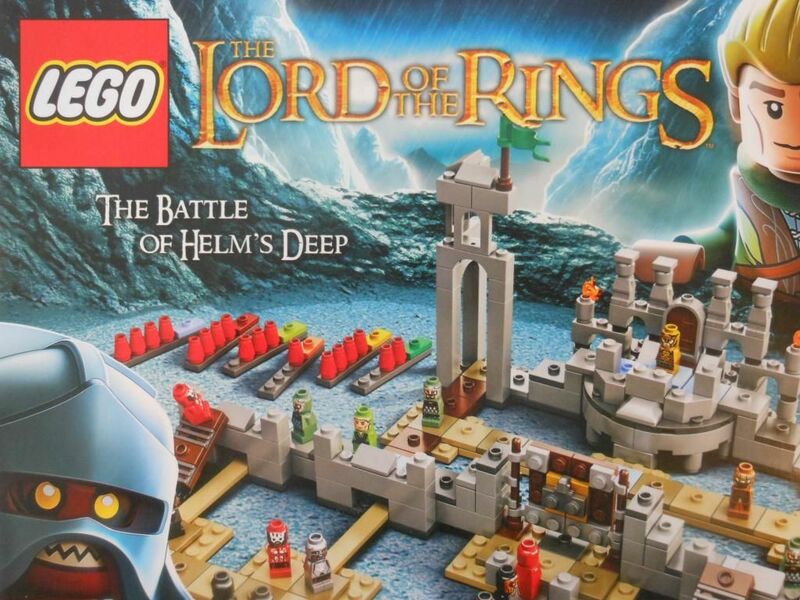 One of the exceptions is The Battle of Helm's Deep. Okay, I admit, I am predisposed to like this game. 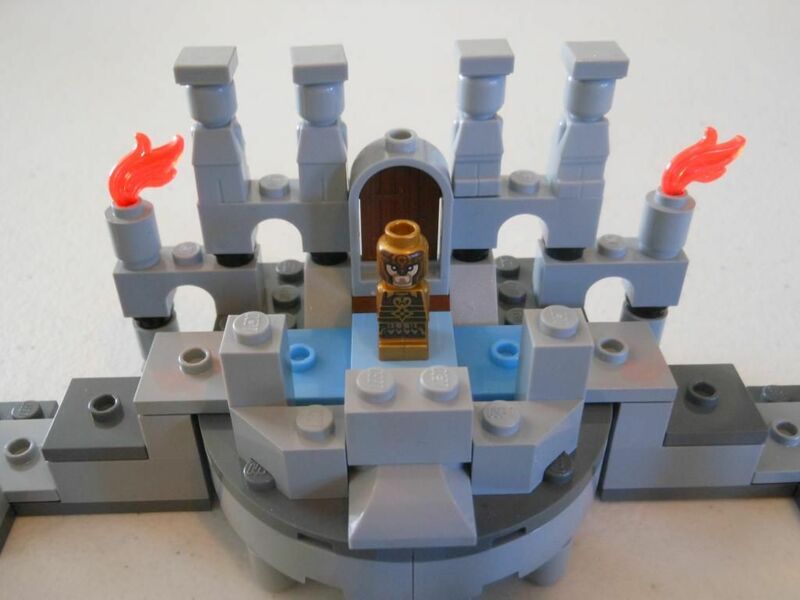 It is based on The Lord of the Rings movies, and it is made with LEGO. Even if the game was the worst game in the world, it would still have a place on my shelf. But, perhaps surprisingly, the game is good. I mean, not really good. Not astounding. The game represents the climactic final scenes of The Lord of the Rings: The Two Towers, when the Uruk-hai army crashes against the defences of Helm's Deep. How do I know it is based on the movie rather than the book? Because one of the characters defending the walls is Haldir, of course. So, the first thing to do before playing is set up the board. This took my daughter about an hour with my help, but she is only three years old. Older children (or adults) should have the game pieced together in about 20 minutes. Once assembled, the game looks pretty impressive. It is small, but the level of detailing is good. It genuinely looks like Helm's Deep, with towers, flags, siege ladders, and pillars. Really very beautiful in that LEGO kind of way. I'd be lyin' if I said I didn't think that looked awesome. One player gets a massive army of Uruk-hai with two leaders, and the other player gets a small selection of named heroes and Rohirrim footsoldiers. The named characters and leaders have four hit-points each and get special powers, and everyone else has only one hit point and can safely be classified as "meat shield." 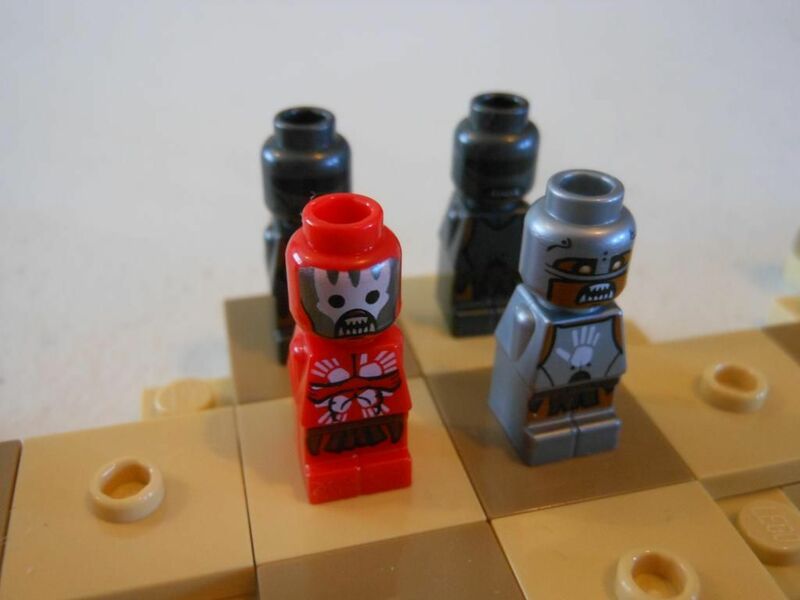 And I should note: these are microfigures, which are about one third the height of a LEGO minifigure. The aim of the game is simple. The bad guys need to storm the walls, and then kill all the good guys or get one Uruk-hai piece to a specific space at the far end of the board. The good guys need to kill both of the enemy leaders. Turns go quickly, and always start with the player rolling a custom dice. 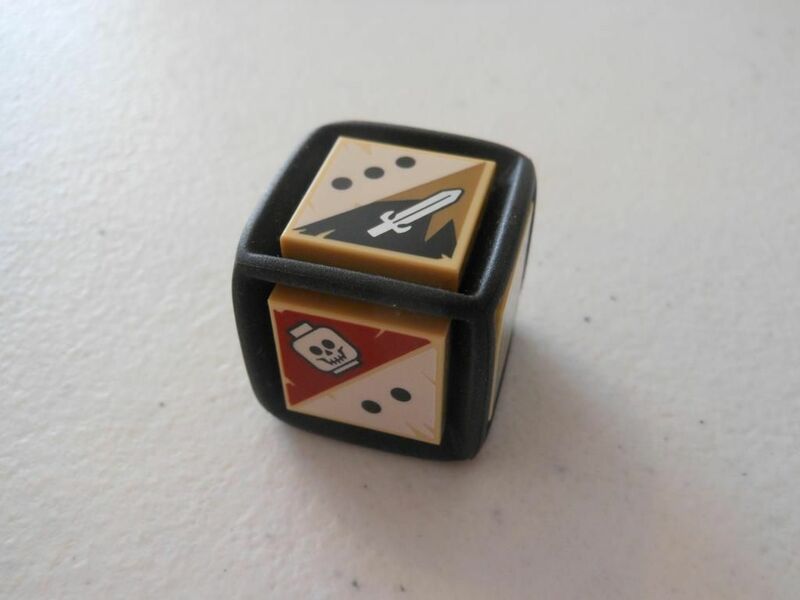 Two faces on the dice have The One Ring icon, two faces have three pips and a sword icon, and two faces have two pips and a skull icon, so there is basically a 33 percent chance of each result. 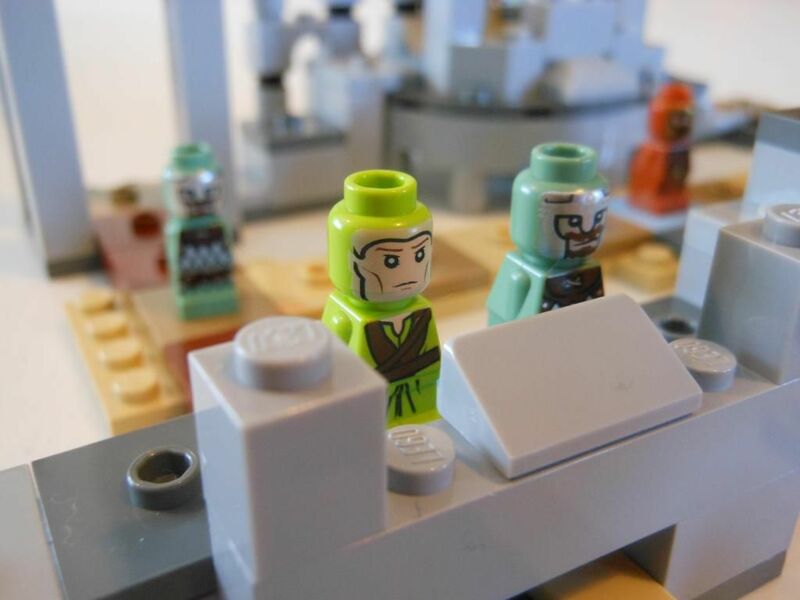 LEGO - probably the best custom dice in the world. After rolling, the player selects one piece to move the number of pips on the dice, and can then make a standard attack with that same piece. If the ring shows up, the player gets to move one piece four spaces or use a special power. Uruk-hai berserkers have the power to move two spaces and automatically inflict two wounds on an adjacent figure; the Uruk-hai archer gets to make a ranged attack (measured with a piece of string that pops onto the figure's head); and the Uruk-hai general gets to spawn new Uruk-hai soldiers to replace the ones that die. For the forces of good, Aragorn and Gimli have the same power as the berserkers; Haldir and Legolas have the archer ability; and Eowyn and Théoden have the ability to heal any character for two hit points. Look! It's LEGOlas... See? It's so funny, I used it twice. The Uruk-hai have weight of numbers on their side, and eventually they will surge over the walls of Helm's Deep (using siege ladders), or they will break open the main gates. Desperate fighting in the narrow streets ensues, and some games can get pretty tense. However, the ability of King Théoden to heal allies from range is incredibly powerful, and this does weight the game slightly in the favour of the forces of good. Uruk-hai warriors, a berserker, and the archer. Of course, there is a lot of randomness involved. For a start, you can only move the number of spaces you roll on the dice, which is normally an awful rule but adds a bit of tactics and tension here. Furthermore, you only get to use a special power if you roll a ring symbol on the dice. However, the worst bit of the game is the rule for making a standard attack. To do this, you roll the same dice again, but this time, if you roll the ring you cause two wounds, if you roll a sword, you cause one wound, and if you roll a skull, you take one wound. In one game, I saw a player wipe out most of his own troops by rolling poorly on every attack, and that is frustrating. That being said, players roll the dice often enough that luck tends to balance out; and the game only takes about 15 minutes to play, so it isn't like an epic two-hour slugfest gets determined by the single roll of the dice. So yes, there is randomness. And yes, it is technically a "roll and move" game. But there are choices to make every turn too, and some interesting tactics. For example, when you move a piece and it finishes its move on top of another piece, it is allowed to hop forwards onto the next available empty space. This is a powerful manoeuvre for the Uruk-hai, who can move soldiers from the back of the army many spaces at a time by hopping along the heads of soldiers in front. The game is light enough that I was able to teach it to my daughter (who likes to play the "goodies," obviously), and she is able to play with only limited guidance from me; yet I have also played against adult gamers. I think the biggest disappointment is that there is no mechanism for simulating the arrival of Gandalf to save the day. It would have been nice to have some kind of countdown mechanism so the Uruk-hai had a certain number of turns to win before Gandalf arrived. Perhaps King Théoden's healing power could have been replaced with the ability to advance a game clock, and once the game clock reached ten, Gandalf arrived. Hmm... Maybe that's something I could think about. King Théoden surveys his troops. 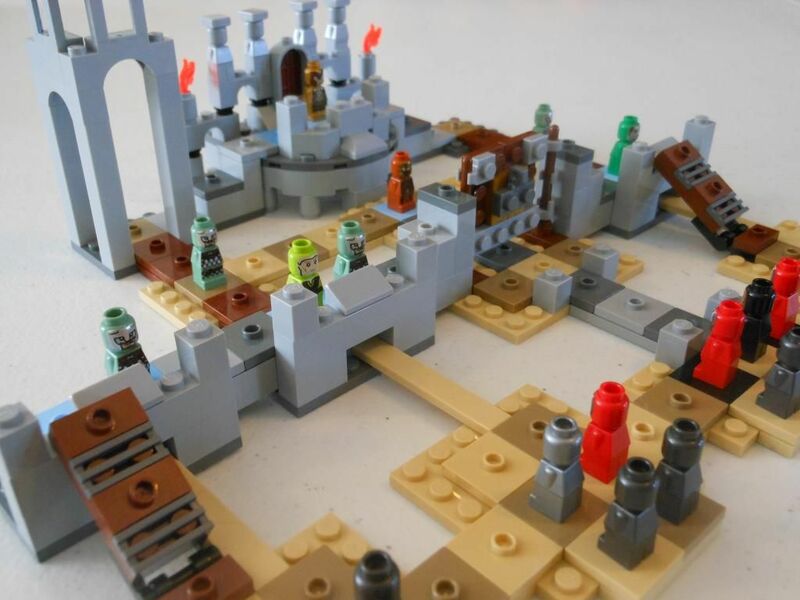 Now, you may or may not know this, but LEGO has decided to scrap the board game line. 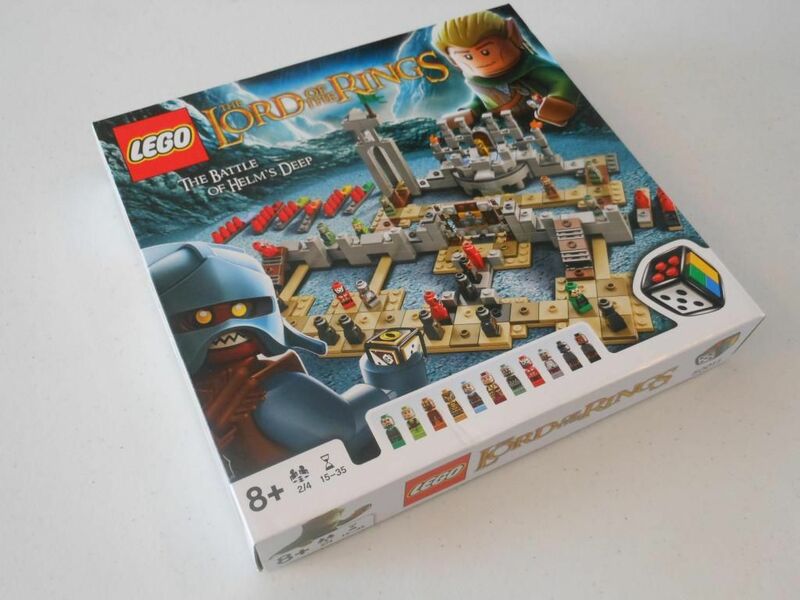 In fact, The Battle of Helm's Deep, along with a Chima game and a pretty cool Batman game, never made it into mass-distribution as far as I can tell. As a result, these games are pretty hard to get outside of the UK. And that's a real shame, because it really feels like LEGO was just hitting its stride. These latest games are huge improvements over their early efforts, but it was clearly too late in the day. So, I intend to keep The Battle of Helm's Deep. It is a light game I can play with my daughter, but which still offers a few interesting choices. 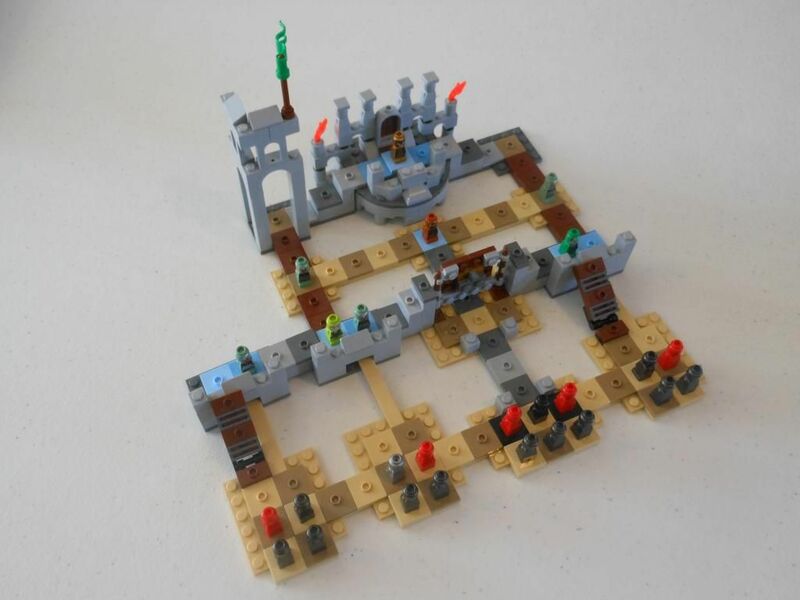 And it is an example of what LEGO could have achieved if they had hit the ground running with the board game line. And yes, my mum still says, "Aren't you too old to be playing with LEGO?" The difference is now I know the answer. No, I'm not. And neither is anybody else. I got the Chima Game from my local Toys'R'Us and I was INCREDIBLY lucky to get Helm's Deep and Batman on Amazon shipped to Canada. I love 'em all and have played with the kidlet numerous times. They're just the right thing for the younger kids. I've got many of the games (all the Heroica ones have, unfortunately gone to that great Lego pile in the kidlet's room) and still kick myself (slightly) realizing that I coulda picked up more of them when I first found out about them, but didn't. I had the Chima game in my hand the other day for £10, but I changed my mind. I already have such a backlog of games to review, I didn't want to add to my woes. It didn't look half bad, and the Chima microfigs were nice. The Batman game is quite basic, and there isn't much in the way of strategy, but my three year old daughter absolutely loved it.